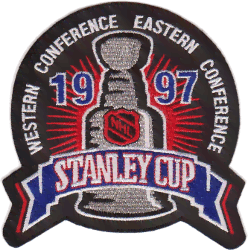 The 1997 Stanley Cup Final NHL championship series was contested by the Detroit Red Wings and the Philadelphia Flyers. Detroit was in the Final for the second time in three years (the other coming in 1995, when they lost to the New Jersey Devils) while the Flyers were making their first appearance since losing in 1987. Detroit won the series in four games to win the Stanley Cup for the eighth time in franchise history and the first time since 1955; Philadelphia had not won since 1975. Detroit was the last team to win the Cup without having home ice advantage in the Finals and with fewer than 100 points earned during the regular season until 2009. For more details on this topic, see 1997 Stanley Cup playoffs. The Flyers arrived into the Final having beaten their perennial rivals, the New York Rangers, in a memorable five-game Eastern Conference Final series. Eric Lindros and Wayne Gretzky each recorded a hat trick in the set, but the size, strength and discipline of Philadelphia trumped the veteran savvy of the Blueshirts. Philadelphia rose to the top on the back of a 17-game unbeaten streak in December and January, and despite losing the Atlantic Division title to New Jersey, had had a relatively easy time with the Pittsburgh Penguins and Buffalo Sabres in the first two rounds. Detroit was the dark horse in the Western Conference, the third seed behind the Dallas Stars and Colorado Avalanche. The Red Wings made their second trip to the Stanley Cup Finals in three years by besting the Avalanche in an often brutal six-game Western Conference final. Even though Detroit won only 38 games, they would get star Brendan Shanahan and the departure of several players whom head coach Scotty Bowman blamed for their loss to Colorado a year prior. Previously, the Wings dispatched a fractured St. Louis Blues team and a surprising rival Mighty Ducks of Anaheim to reach the conference finals for the third straight season. This is the first time that these two teams met in the postseason. Game one in Philadelphia took place exactly ten years to the day after the Flyers' emotional seventh-game loss to the Edmonton Oilers in the 1987 Finals. Detroit never trailed in the game: they led 2–1 after the first period, 3–2 after the second, and Steve Yzerman scored the fourth goal 56 seconds into the third period. Sergei Fedorov scored the winner and was named the game's first star. Brendan Shanahan scored an unassisted goal 1:37 into the game and Steve Yzerman scored a power-play goal at 9:22 of the first period to give the Red Wings a 2–0 lead before Rod Brind'Amour scored a pair of power-play goals late in the first period to tie the score. In the second, Kirk Maltby scored the game-winning goal at 2:36 and Shanahan scored his second goal of the game at 9:56 of the third and the Red Wings won a second consecutive 4–2 victory and a 2–0 series lead heading back to Joe Louis Arena. John LeClair scored at 7:03 of the first period to give the Flyers their first lead of the series. Two minutes later, Yzerman scored on the power-play to tie the score. Fedorov scored two minutes later to put Detroit ahead for good in the game. Martin Lapointe scored later in the first to give the Wings a 3–1 advantage. The Wings tacked on two more in the second and added one in the third for a decisive 6–1 win and a three-games-to-none series advantage. For his four-point night, Fedorov was named the game's first star. In his post-game comments, Flyers head coach Terry Murray was quoted as saying the team was "basically in a choking situation," which many observers interpreted as Murray having called out his own players as chokers. The manner in which they played compounded by the insurmountable series deficit along with the Wings' seeming dominance in stretches of the first two games as well as most of game three lent credence to the claim. The Red Wings controlled the game from the get-go, forging ahead 1–0 after one period and employing the left-wing lock to keep the Flyers' mix of big and speedy forwards at bay. Darren McCarty's second-period tally effectively sealed the deal. The burly checker faked out Flyers rookie defenseman Janne Niinimaa inside the blue line, swooped around him, then did a quick cutback in front of Hextall in his crease to slip the puck into the net. Eric Lindros would score his lone goal of the series with 15 seconds to play. The 2–1 win brought Detroit its eighth Stanley Cup, and its first in 42 seasons. Sergei Fedorov led the Wings in playoff scoring with 20 points. Detroit goaltender Mike Vernon, who had been in net for the whole of the Wings' failed 1995 playoff run, and relegated to the bench the year before, earned vindication and his first Conn Smythe Trophy as playoff MVP by holding Philadelphia to six goals in four games. Hodson played only six games (dressed for 23 games), but name was included on the Stanley Cup, because he spent majority of the season with Detroit. #22 Mike Knuble† - played 9 regular season games, did not qualify to be engraved on the Stanley Cup. He was left off for playing 68 games in the minors for Adirondack. Johnny Remejes† (Dressing Room Asst. ), Mike Vella† (Dressing Room Asst). Each of 3 members and many other members not listed were awarded Stanley Cup rings. Diamond, Dan (2008). 2008 Playoff Media Guide/Total Stanley Cup. NHL.